As soon as Sophia seen this her face lit up and she could not wait to play with her. It is a Princess Poppy Troll with amazing 35cm bright pink hair that sticks up. You can bend her hair and brush it with the brush provided and her hair is also magical as it lights up and plays music when you touch it. You can also activate her music by pressing her necklace. 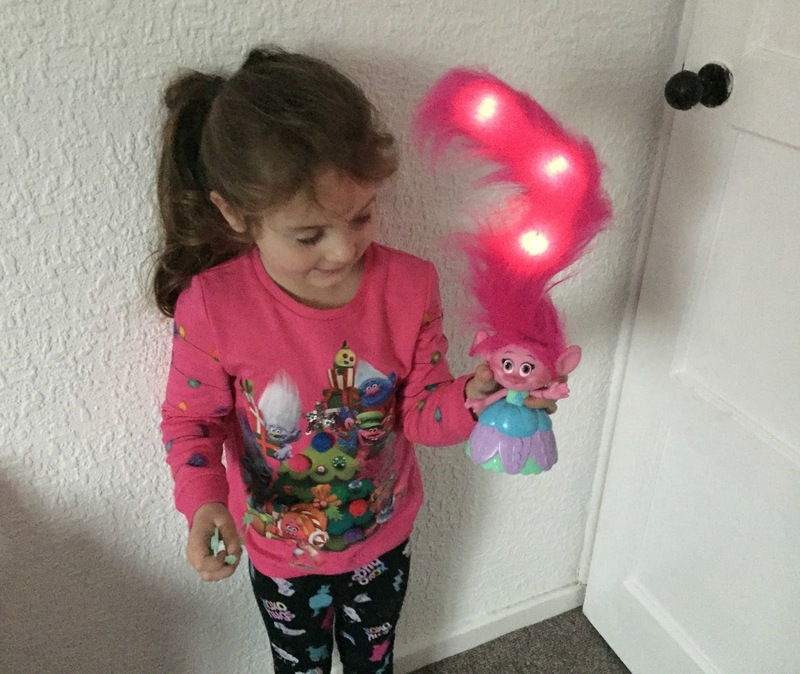 This is a lovely toy and my little girl is amazed that her hair lights up and she sings, she has carried her around and played with her non-stop for days. The Hair in the air Poppy is available to buy from Argos, Amazon and all good toy retailers for around £29. 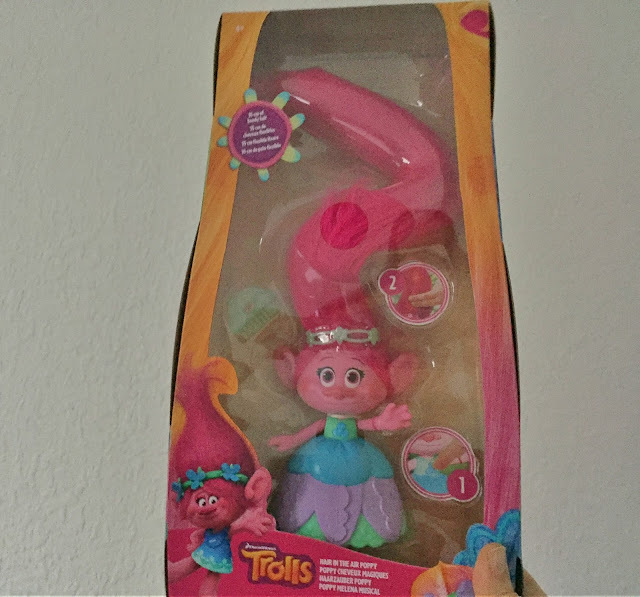 We were sent some Troll-Tastic clothing that my daughter put on before I could even photo it! We were sent a T-shirt with Poppy on (£6) some leggings (£5) and even a Trolls Christmas jumper (£10) all from George at Asda. 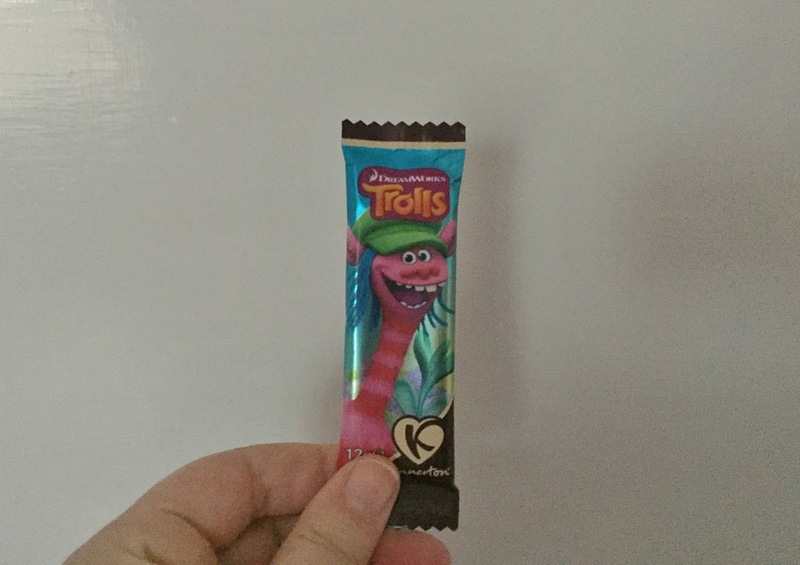 Children can build their own version of the Trolls Tree with this fun toy, it has moveable pods making it easy for children to customise it. 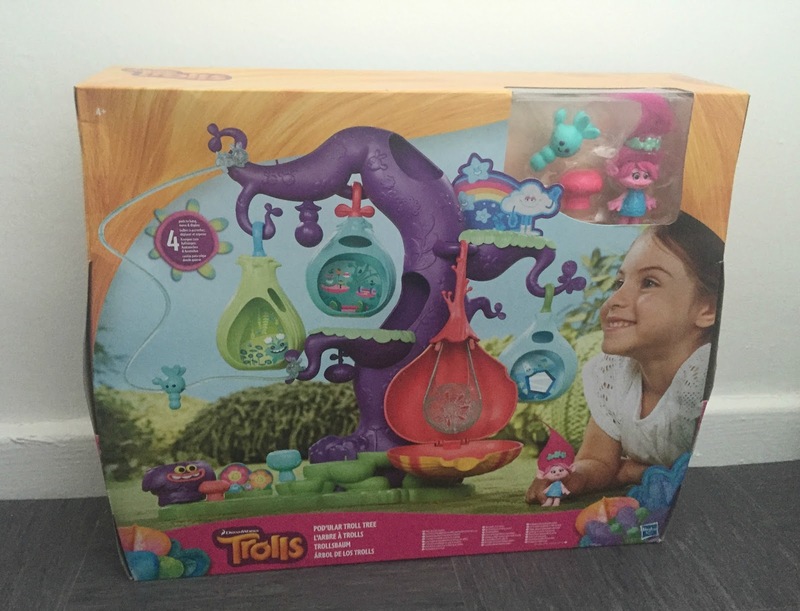 It also has a slide that the Trolls can side down and I just know Sophia will have so much fun playing with this. It is priced at £44.99 but is currently on offer on Amazon for just £19.99. My children are obsessed with blind bags, they go crazy for them thanks to watching videos of them on YouTube. 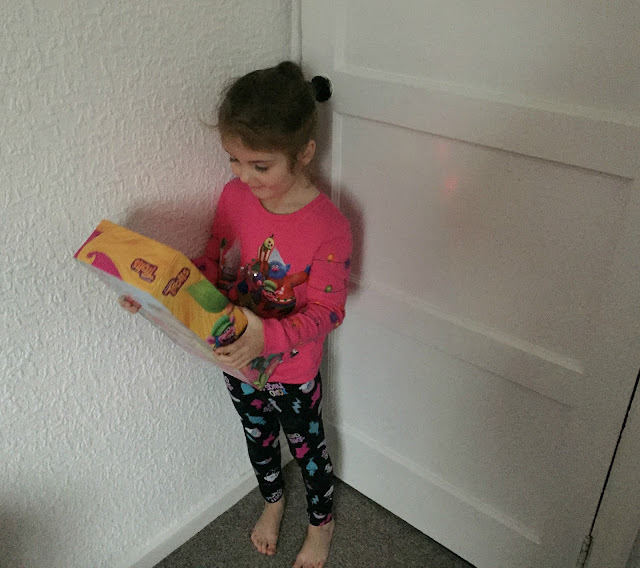 We are planning on filling their Christmas stockings with lots of blind bags, they really do love them so much. 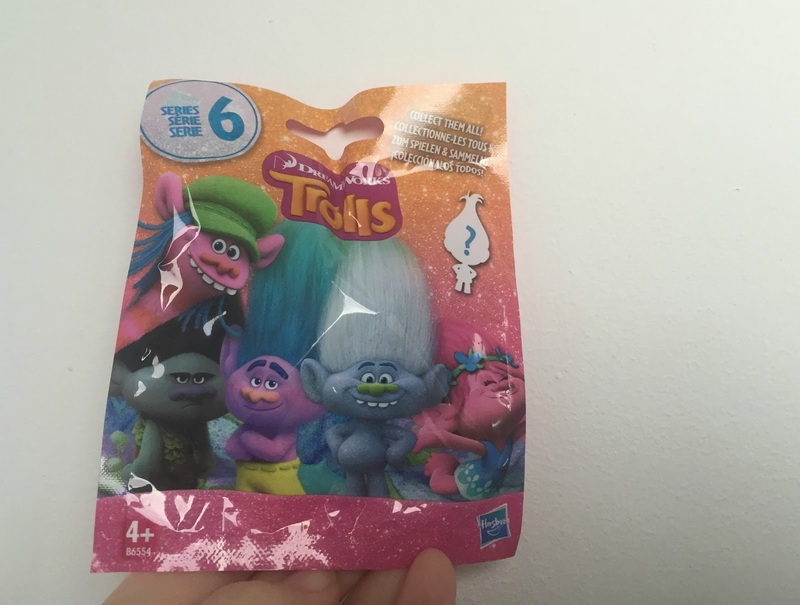 I had no idea you could buy Troll's blind bags though and I think these would make a great stocking filler gift idea. You can buy them from Tesco, Amazon, Argos and most toy retailers for a couple of pounds. 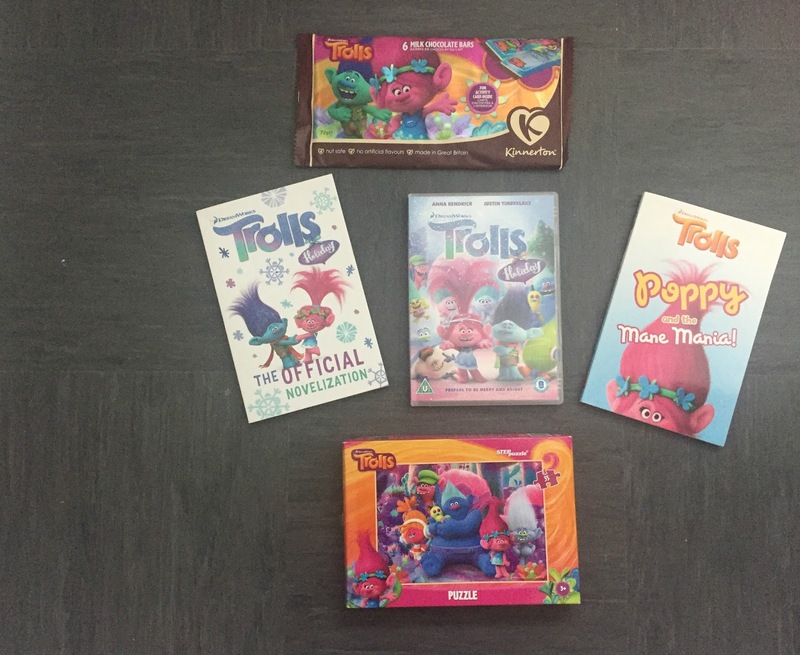 We were sent two books, Poppy and the Mane Mania and Trolls Holiday the official Novelization both priced at £5.99 each. Sophia is a little bit too young for these as she is only four and just starting to learn to read. I think slightly older children would love them though. It wouldn't be Christmas without chocolate and you can even buy little bars of Trolls chocolates. Of course as soon as Sophia and her little brother seen these they wolfed them down. I had no idea you could buy so many wonderful Trolls themed gifts and I am sure we will be having a Trolls Holiday this year, watching the film and playing with (and wearing) all Sophia's new Trolls goodies. Which gift do you like the look of best? Disclosure we were sent these products for the purpose of this post.